The long awaited launch of the exciting new golf training aid – the SliceStoppa® – is nearly upon us. Filming of the SliceStoppa in action was completed recently at two great locations. Being ideal for use on the range we were able to use the very popular Topgolf Driving Range and Entertainment Complex at Chigwell in Essex, and we then moved on to one of the UK’s oldest golf courses – Ilford Golf Club – a superb location close to London. From the videos you can see how compact and easy the SliceStoppa is to assemble and use. It is simple and affordable, but most of all a great way to practice properly so you can enjoy your golf out on the course. Being in your eye line when you practice, it’s easy to visualise it out on the course keeping you focused and confident. Ian Joyce, founder of SliceStoppa, said: “SliceStoppa can be used on any surface. 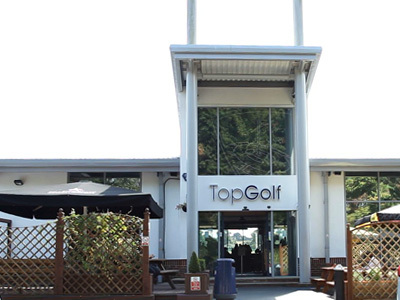 Being compact it’s ideal for the driving range, like here at the very popular golf and entertainment centre, TopGolf in Chigwell. Apart from the obvious, the SliceStoppa can be used for at least another eight useful drills, including preventing the Hook. SliceStoppa – don’t be without one!